ANYONE!!! If I can ship the knitted toy to your address, then you can enter! Wow so kewl!! I like the Chef!! They’re all so darling! I absolutely adore the chef. I love the ballerina girl she is delightful! And what a kind offer on your part! If I knew how to reblog I would! This is an awesome post and thought I would share it with you so you, too, can have a chance to experience the great work this woman does. Good luck to all and thank you for the opportunity!!!! Thank you for such wonderful opportunity. My granddaughter would just fall in love with the nurse!!!!! I have ‘liked’, reblogged, and have already been following you. What sweet dolls and toys. You are so creative. I can follow a pattern, but designing that is something way beyond me. These are gorgeous! I like the nurse because my 17 year old daughter is currently applying to be a mid-wife! Oh wow, the nurse would definitely mean a lot to her!!! Please leave a name so I can add it to my excel sheet :D You can e-mail it to me or reply to this comment! Thank you! I wasn’t logged in to my blog so it made me anonymous, I am still learning how to use it! My name is Tracy Lucas, I have liked your blog and added you to my facebook and now I am going to add the nurse to my pin it! Estes são alguns dos fantásticos brinquedos que a Crayons and Milk cria. Merece ser visto e contemplado. Thanks for liking my post! I love your sheep! I just love the nurse doll, it would be great for Amy as she wants so desperately to be a mid-wife! These are all too cute! I’d love the nurse one to give to my hard working nurse mum! I have put you on my face book page so that everyone gets to see your unique gift! So sweet of you! I’ve never made toys. I like the ballerina-I’d save if for when my granddaughter is old enough not to eat it. Very cute stuff you’ve done here including the blog site. Very kitchy! And thank you for liking mine as well. We bloggers should stick together and support the small biz ladies. Keep up the cute work and I’ll keep following. Hi I am a follower of your blog and love love love the sweet ballarina! I pinned your blog and nice contest, also. The ballerina is adorable! They all are. So precious. Oh my goodness, the ballerina is too precious! Can you ship to India? :) The toys are very cute!! They’re all so cute! I love the chef best of all though. I think he’d look wonderful in my kitchen, to encourage me when I’m cooking! I love all your amazing crochet projects! I have attempted such projects before and failed miserably, so my hat is off to you! You are so talented. Love the Ballerina! 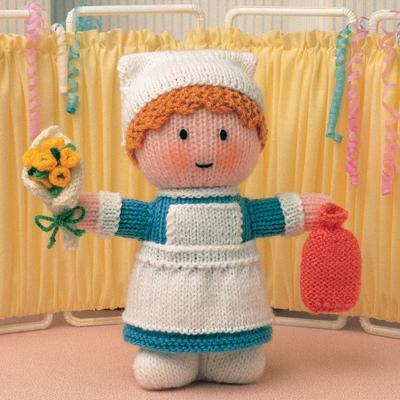 They’re all wonderful; I love the nurse, though, with her little hot water bottle. Reminds me of my years working in midwifery! 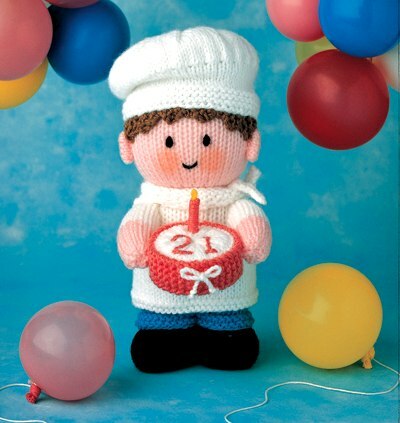 My sister will love your blog, she knits too! Thank you! Don’t forget to comment on which toy you would like! They are absolutely gorgeous!!!!!! I adore the ballerina. !!! I would prefer the ballerina for my daughter! So adorable! I love the ballerina… Too cute! Ooooo – loving me some chef!! So cute! Great Idea – Fantastic Talent – Sublime Toys! Chef CHEF chef chef ChEf!!!! Love him (or was it a her hmmm?) Reblogged, commented, loved it! You go girl! Happy to highlight the adorable knitting blog, Crayons and Milk – not only is it a source of endless delight and cuteness, the owner was kind enough to like my baby clothes post. There’s also a great giveaway contest at the moment where the owner is doing a draw for a hand-knitted toys and they are just gorgeous! This is my reblog post and I’d love to win the chef! So cute. Adorable again! I would love the ballerina. Actually, I wouldn’t mind which one I won— all so cute! I, personally, heart the chef but I would LOVE the nurse. One of the greatest people I know is a terrific and compassionate nurse and she just lost her father this past week. I would love to spread the amazing wealth of this giveaway and present her with the nurse just to put a smile on her face! They are all beautiful, but the ballerina is amazing, you do wonderful work !! I like the chef. Thanks for reading. This is such a lovely idea! I love the ballerina! I will attempt to reblog it as well! I love this idea! I hope I can build up to doing something like it one day! I love them all! If I get drawn, you choose for me, okay? They are adorable. I am mentioning you in my blog this morning. Thanks for sharing your toys! They are all adorable, but I would really love the ballerina!! Already follow your blog.. I shared this giveaway on FB as well.. I “liked” it that way on your blog!! Thank you! I’ve added your name twice to my excel sheet! I am a new follower. I can’t decide between the ballerina and the chef. I reblogged this on Triedtestedandtruemommy.wordpress.com and I would love the nurse! These toys are adorable! I knit and crochet, but only flat things. LOL Do you have an etsy shop? So very cute it is hard to choose! I’ll have to say the ballerina would be my fav. OH! forgot to mention – reblogged and tweeted. I already follow your blog…love your posts…and you don’t even need to make me one…just ‘cuz you’re my everyday gift :D Besides, it looks like your excel list will run out of space! They are all creative and wonderful. Love the Nurse! Good luck with the comp! They are so pretty, I was gifted a scarecrow (the one from wizard of oz) when I was a kid, was always fascinated about how it was knitted. how adorable! you are so talented. ballerina!